The "Wide" is perfect for presenting bottom baits, pop-up´s, or snowman rigs. 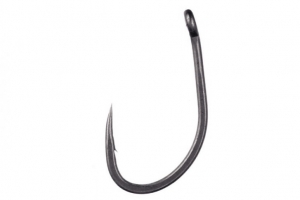 The inwardly curved beak point is the best style to use when your rig may potentially rest on gravel. When the rig is retrieved there is far less chance of the hook point becoming damaged by stones. It’s a short shank hook having a straight eye and forged shank. Available in sizes 4, 6 and . Sold in packs of 10.